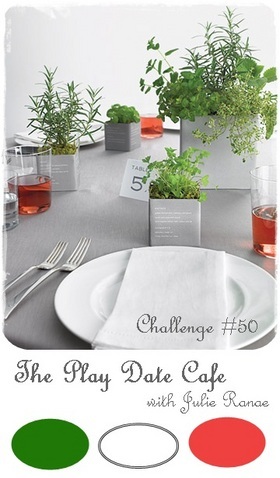 It's time for another color challenge over at The Play Date Cafe! This week, it's all about Christmas in the Cafe! Julie Ranae is your Color Story Hostess this week with Green, Melon Red and White as your colors, and we have Elusive Images as our wonderful sponsor! Be sure to play along this week, prizes will be awarded to the Cup of the Week, and ALSO the Fab 4 Winners - how cool is that! 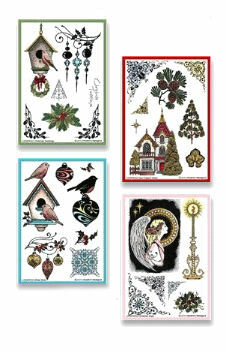 Elusive Images is a rubber stamp company with a wide range of designs and styles. 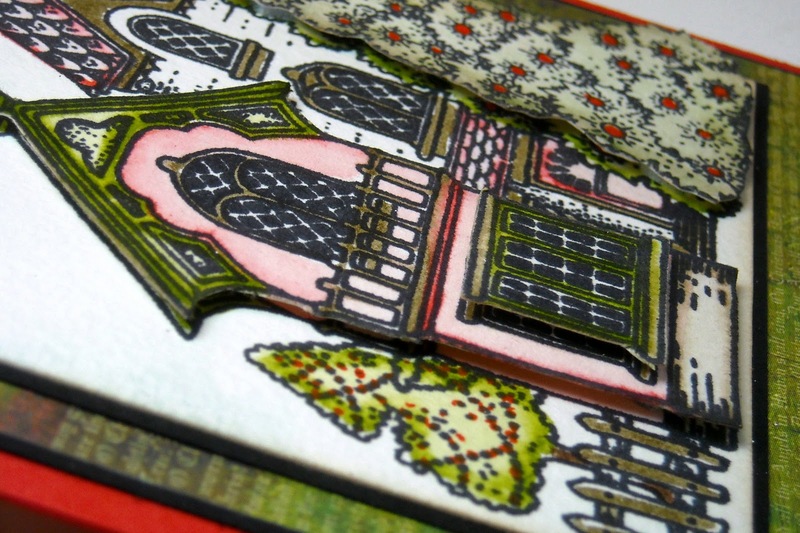 Founded in the UK by Glenda Waterworth over 10 years ago, EI prides itself on both the design and manufacture of its rubber stamps, together with the Artylicious range of CDs. From original hand drawn images to final product every care is taken along the way to sustain the company’s reputation for good quality. The Cup of the Week will receive ALL FOUR of these beautiful stamp sets, each Fab 4 Winner will receive ONE of these sets chosen by Glenda at Elusive Images. 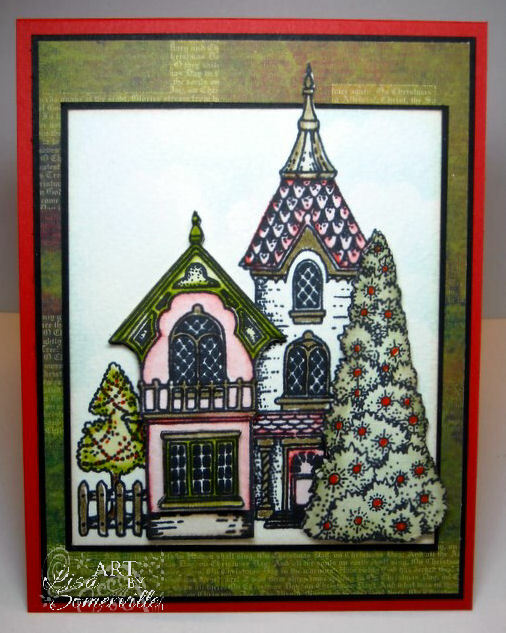 The PDCC Designers were all given Elusive Images Christmas stamps to use with today's challenge - I received the beautiful New England Winter Set. Being sponsored by Elusive Images, and not having one of their sentiments, I chose to leave the sentiment off my card. One can easily be added in the open space, or a handwritten "from our house to yours". You can't see the dimension in this photos, but the small snippet at the top of my blog shows how I popped out the tree, house and window with dimensionals. The images were stamped in Black Archival on Watercolor paper then colored using the Marker Watercoloring Technique. I did add a touch of Brown as a "neutral" for parts of the house, tree trunk and fence. Here's this weeks Color Story Photo. We'd love for you to play along with us at the Cafe, you can find all the details here on how to enter. If you upload to any online gallery please use keyword PDCC#50 so we can find your creations! Lisa...I love all the dimension on this card...you and I used the same watercolor technique, only I took my color straight from my ink pads. Beautiful! The houses are so pretty and lovely in their coloring. Love how you put together your scene! Great card, love the dimension of it! Beautiful image AND card! So pretty! Lisa, this is so pretty! Love the way the Christmas tree just stands out! Awesome colors! Such a beautiful card Lisa. I love how you've colored the houses. The card is beautiful and as you discovered just cries out to be decoupaged doesn't it. I love how you coloured it too. As an Elusive Images DT member I really enjoyed playing along with you all this week and will try to join in in the future when I can. Fabulous artwork & inspiration for this challenge. Love that stamp! Beautiful Lisa! Love the wonderful detail and dimension! Superbly elegant card! You've created such a beautiful scene here Lisa, what a lovely card! Gorgeous card, Lisa! If any piece of your work shows that you have the Maker Water Color technique down perfectly...this is it! There are so many little details. You sure can control your colors to do exactly what you want! Good for you! I just love this card. It is really bright and cheery. I've finally overcome time and technical issues to get round and say thank you to everyone who took part in the PDCC that we sponsored. I love what you did with the stamps - the detailed colouring is beautiful and the house glows with warmth.